I call this project FILTER: Freely Improvising, Learning and Transforming Evolutionary Recombination system. 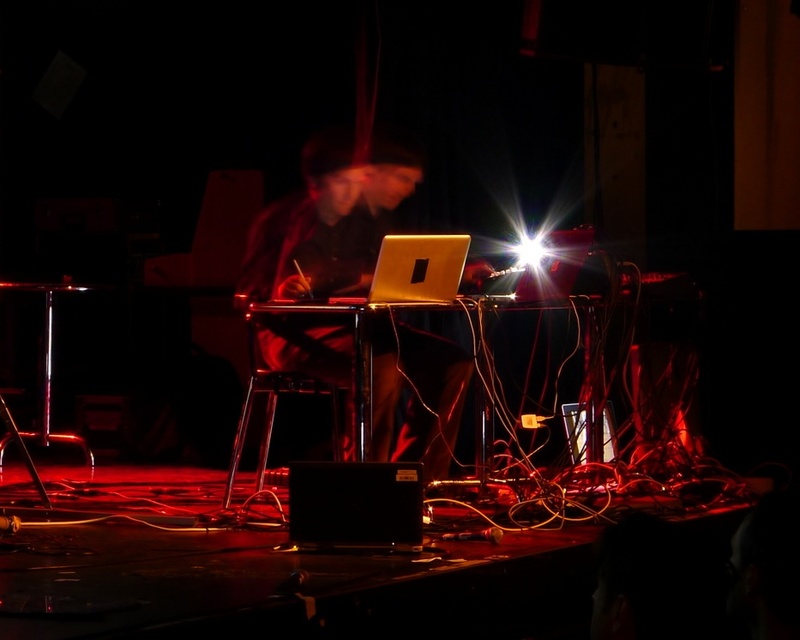 It is both a design of an “intelligent” interactive machine performer and a generative composition – a system endowed it with a universe of possible musical actions that fit with my own aesthetic and approach to electroacoustic improvisation. My interest is in creating a system that can listen to the textural and gestural qualities as well as the stylistic tendencies of a performer and to take musical actions, improvising as a partner with the player and using their own audio as source material. FILTER does this by recombining, transforming and re-presenting this material in a radically new form as a new musical offering, in dialogue with its human partner. In some sense, I consider this as a project that is a reflection and genetic re-creation of what I do as an improvising “laptop musician” with GREIS wherein I capture sounds on the fly and transform them. After a bit of a hiatus to build the DisPerSion Lab, I will again continue to develop FILTER as an interesting performance partner and as a generative composition of sorts – perpetually providing new music and new ideas. Below is an excerpt of a performance sesions with FILTER and Sam Sowyrda (of Cloud Becomes your Hands and the Dan Deacon live band). I like this one because Sam uses a wide timbral variety of objects, and because he is a Deep Listener who respects the system as a fellow player. This is clear in that the dynamics are well matched; also I find the interplay quite nice where Sam sometimes takes the lead and FILTER created textural layers or loops, while other times it switches to more varied events and Sam creates his own rhythmic “loops” in support of this. Listen for the materials selected by the machine, and realize that there is no human hand in terms of decision making (content, dynamics, timing, etc.). A second, recent example is a set with percussionist Paul Hession at Cafe OTO in London, as part of the Musical MetaCreation event (“MUME @ NIME”), curated by Ollie Bown. In this excerpt, sometimes FILTER is very clearly doing machinic things (e.g. long drone, phase vocoder-sounds) and at other times it is creating new patterns from the sonic material Paul had played previously. It listens to what he is doing in the moment and plays with him. I like this section because they collectively modulate their intensity and density.